CAREER TRANSACTIONS: Was drafted in the first round (10th overall) by the Miami HEAT in the 2015 NBA Draft…signed by the HEAT on July 3, 2015. Appeared in 18 games (15 starts) for the HEAT and averaged 10.9 points (.356 FG%, .617 FT%), 5.2 rebounds, 3.7 assists, 1.44 steals and 34.7 minutes…missed 64 games due to injury…sat out 16 games from Nov. 15-Dec. 12 with a sore left wrist and missed the final 48 games of the season (Jan. 1-Apr. 12) due to a right shoulder injury which required surgery on Jan. 5…topped the team in scoring once, in minutes eight times, in plus/minus on six occasions, in steals four times and in rebounds and assists twice each…was Miami’s leading scorer off the bench twice and also led the HEAT reserves in steals three times and in assists, minutes, blocks and plus/minus once each…scored in double figures 11 times, including one 20-point performance…grabbed double-figure rebounds once and posted one double-double…had at least one steal in a career-high 10 straight games (Oct. 30-Dec. 18)…had six multi-steal games and one multi-block game…recorded career highs in points (23) and field goals made (10) and matched his career high in rebounds (13) and steals (4) vs. the Lakers on Dec. 22…Season Highs: 23 points (vs. L.A. Lakers, Dec. 22), 13 rebounds (vs. L.A. Lakers, Dec. 22), seven assists (vs. Sacramento, Nov. 1), four steals (three times), two blocks (at Orlando, Oct. 26) and 46:09 minutes (vs. Orlando, Dec. 20). 2015-16 SEASON: Appeared in 78 games (eight starts) for the HEAT and averaged 6.4 points (.422 FG%, .684 FT%), 5.2 rebounds, 1.5 assists and 28.6 minutes…missed three games (Dec. 28-29 and Apr. 12) with a sprained left ankle…was a DNP-CD once (Jan. 1 vs. Dallas)…earned NBA All-Rookie Second Team honors…ranked among the NBA rookie leaders in minutes per game (4th), steals per game (6th), rebounds per game (9th), assists per game (14th) and scoring average (14th)…led the HEAT in plus/minus (+111) and also in games played, becoming just the fifth rookie in franchise history to lead Miami in games played…ranked third on the team in total rebounds and fourth in minutes played, defensive rebounds and steals…his 322 defensive rebounds were the third most in a season by a HEAT rookie…topped the team in scoring once, in steals 23 times, in minutes and rebounds seven times each, in blocks six times and in assists once…was Miami’s leading scorer off the bench 12 times and also led the HEAT reserves in minutes a team-high 38 times, in rebounds and steals each a team-high 33 times, in assists a team-high 25 times and in blocks on 16 occasions…became just the fourth rookie in franchise history with at least 25 blocks and 25 three-point field goals made…scored in double figures on 15 occasions, including one 20-point performance and grabbed double-figure rebounds on seven occasions…had 19 multi-steal games and three multi-block games…made his NBA debut vs. Charlotte on Oct. 28 and tallied five points, seven rebounds and two assists in 25:30 of action…made his first NBA start at Golden State on Jan. 11 and totaled seven points, three rebounds, one assist, one steal and one block in 25:33 of action…Season Highs: 20 points (vs. Denver, Mar. 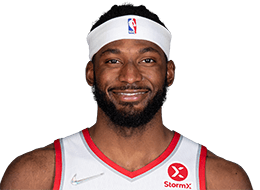 14), 13 rebounds (at New York, Feb. 28), six assists (at Washington, Jan. 20), four steals (vs. Indiana, Feb. 22), two blocks (three times) and 42:37 minutes (at Toronto, Mar. 12). NBA PLAYOFFS: 2016: Saw action in 13 games (two starts) for the HEAT and averaged 6.9 points (.432 FG%, .700 FT%), 4.8 rebounds and 25.4 minutes…did not miss any games due to injury, but did miss one game (Game 3 vs. Toronto) as a DNP-CD…was third on the team in offensive rebounds…topped the team in steals three times and in rebounds once…was the leading scorer off the bench four times for Miami and also led the HEAT reserves in rebounds and steals five times each, in minutes and assists three times each and in blocks once…scored in double figures twice…came off the bench in all seven games against Charlotte in the Opening Round and averaged 6.4 points (.425 FG%, .692 FT%), 4.7 rebounds and 23.7 minutes…made his NBA postseason debut against Charlotte in Game 1 on Apr. 17 and tallied eight points, four rebounds and one steal in 27:06 of action…appeared in six games in the Eastern Conference Semifinals series vs. Toronto and averaged 7.5 points (.441 FG%, .706 FT%), 5.0 rebounds and 27.2 minutes…started the final two games of the series at center…made his first NBA postseason start in Game 6 vs. Toronto and totaled 12 points, three rebounds and one steal in 26:55 of action…tallied postseason career highs in points (14), free throws made (6) and attempted (8), steals (2) and blocks (2) and added eight rebounds in Game 7 at Toronto on May 15. HONORS: 2015-16: Named to the NBA All-Rookie Second Team…named to the 2016 USA Basketball Men’s Select Team. Played one season at Duke University before declaring for the NBA Draft as an early entry candidate…appeared in 39 games (all starts) for the Blue Devils and averaged 12.6 points, 6.5 rebounds, 2.1 assists, 1.33 steals and 29.1 minutes while shooting 48.6 percent from the field, 41.8 percent from three-point range and 64.1 percent from the foul line…helped lead the Blue Devils to the 2015 NCAA Championship…among Duke freshman in school history, finished fourth in double-doubles (7), tied for fifth in double-figure rebound games (8), tied for fifth in double-digit scoring games (30), tied for eighth in points (492), ninth in three-point field goals made (46) and tied for ninth in steals (52)…was selected to the All-ACC Freshman Team and the USBWA All-District III Team…earned a spot on the All-ACC Academic Team…was named ACC Rookie of the Week on Feb. 9…was a finalist for the Erving Award, given to the nation’s top small forward…was the third-highest scoring freshman in the ACC and capped the season with the second-most double-figure scoring efforts and the second-highest rebound average by a freshman in the conference…became just the eighth Duke freshman to post three consecutive double-doubles (Jan. 31–Feb. 7)…recorded four 20-point games…led the team in three-point field goal percentage…finished second on the team in rebounds (252), steals, blocks (34) and free throws made (100) while placing third in points, assists (82) and three-point field goals made…led team in rebounds 14 times, scoring on six occasions and assists three times…during the NCAA tournament, he outperformed each of his statistical categories from the regular season as he started all six games and averaged 14.3 points, 9.3 rebounds, 2.7 assists, 1.67 blocks and 1.50 steals while shooting 50.9 percent from the field, 57.1 percent from three-point range and 75.9 percent from the foul line…was named to the NCAA Final Four All-Tournament Team and the NCAA South Regional All-Tournament Team. Full name is Justise Jon Winslow…answers to the nicknames “JWins”, “JDubb”, “Jus-Blaze” and “Rubdi”…has his own website (iamjustisewinslow.com)…son of Robin Davis and Rickie Winslow…has three older brothers (Cedrick, Brandon and Josh) and an older sister (Bianca)…his father played college basketball at the University of Houston (1983-87) and was a member of the famed Phi Slama Jama team that included Hakeem Olajuwon and Clyde Drexler…his father was selected 28th overall by the Chicago Bulls in the 1987 NBA Draft and played seven games for the Milwaukee Bucks during the 1987-88 season before playing for several teams professionally overseas (1987-2000)…his brother, Josh, played football at Dartmouth, and his sister, Bianca, played basketball at the University of Houston…his cousin, Michelle Taylor, played basketball at Appalachian State University…credits his older brother, Josh, for making a difference in his life by taking him under his wing and making him stronger with tough love and showing him the ropes of life…his interests include video games, swimming, art museums, watching documentaries, learning to produce music, making short films and doing volunteer work…when his playing career is over he would like to start his own department in a boarding school for kids interested in performing arts…has endorsement deals with adidas, Sprint, Excel Auto, Mountain Dew, MET-Rx, Panini and JBL…helped raise money for the victims of Hurricane Harvey in his hometown of Houston in September of 2017…traveled to Singapore in August of 2017 representing the NBA as part of the Jr. NBA program where he participated in clinics, on-court instruction, visits to partner activations, a social function with coaches and campers and interacted with fans, local athletes and celebrities…founded Robin’s House Foundation with his family with the vision to nurture children, empower the youth and strengthen families…the foundation’s mission is to encourage and guide children and young adults to discover their highest potential through education, recreation and community outreach…has hosted The Justise Winslow Invitational Camp, a free two-day basketball camp in his hometown of Houston each of the past three summers for 80 boys who range from 5th to 8th grade…the campers are chosen based on an essay they have to write about bullying with 80 chosen from over 250 applicants…in addition to the free camp and lunch, campers also receive free gear, backpacks and shoes…has also held a back-to-school event where he provided students with needed school supplies and encouraged kids to pursue higher education…hosted a youth talent show (D.R.E.A.M. Showcase) in Miami in 2016 to connect with inner-city kids by providing them with an outlet to learn and participate in the performing arts…hosted a holiday lunch for 20 seventh graders in Overtown in December of 2015…participates in the Son of a Saint Foundation, a nonprofit organization dedicated to enhancing the lives of fatherless young males through education, mentorship, mental health and sports programs…has volunteered at Texas Children’s Hospital as part of a literacy out-reach program and as a youth basketball coach…was co-chair of the African-American Affinity Group as a high school senior…had his high school number (42) retired on Feb. 1, 2016…finished his high school career with 3,208 points and 1,708 rebounds and averages of 23.9 points, 12.8 rebounds, 3.2 assists, 2.2 steals and 2.00 blocks in 125 games…was a 2014 McDonald’s All-American and a two-time Gatorade Texas Boys Basketball Player of the Year…earned gold medals with USA Basketball at the 2014 FIBA Americas U18 Championship, the 2013 FIBA U19 Championship and the 2012 FIBA U17 World Championship…favorite athletes are Jackie Robinson and Cassius Clay…his favorite sports other than basketball are football where he is a fan of his hometown Houston Texans and soccer where he is a fan of PSG and AC Milan…threw out the ceremonial first pitch prior to the Atlanta Braves-Miami Marlins game at Marlins Park on Sept. 22, 2016…his game day routine includes eating a peanut butter and jelly sandwich layered with jalapeños…wears size 14 sneakers.